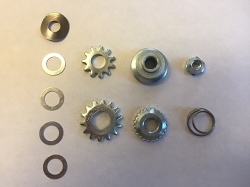 Welcome to Wise Guyz Gadgets, your source for unique handmade quality products and gifts. We offer hand crafted items for your home, garden, family and friends that you won't find anywhere else! From our best-selling Wisehooker™ Grilling Tool to our easy-to-use nutcrackers, turkey lifters and gardening tools, you'll find the perfect item for yourself or as that unique gift you were hoping to discover. Quality craftsmanship, superior materials, and reasonable prices are our guarantees. Our handcrafted products are built to last and to be enjoyed for many years. We hope you enjoy the selection of products we offer and we look forward to serving you. We also love hearing from our customers. If you have one of our unique gadgets, please send us an email with your comments. Hook-n-Lift Turkey Lifter & Wisehooker Grill Tool By Grill Wise Gadgets Home of the original WiseHooker, Clean-n-Flip, the ultimate barbeque grilling tool. Considered by many to be the worlds best multi purpose grill cleaning and food flipper grilling tool. 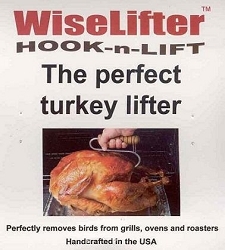 Also the WiseLifter, the perfect turkey lifter. The easy and secure way to remove turkeys from the grill or roasting pan. 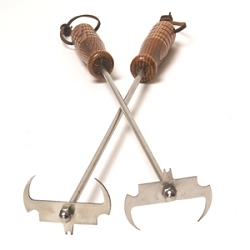 The grill tool and turkey lifter are made from high grade stainless steel and a custom made solid ash hardwood handle. They make wonderful unique gifts. Home of the original Wise Cracker, Twist-n-Crack wooden nutcracker, America’s Favorite nutcracker and the worlds best pecan cracker. It also works great as a crab cracker for cracking crab legs and crab claws and also as a lobster claw cracker. Welcome to Craft Wise Gadgets Home of the original WiseFormer, Roll-n-Form, a creative paper and foil forming tool and plant pot maker. 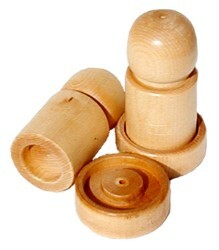 Handmade from solid maple hardwood with durable long lasting finish. The perfect gift for the crafty person or natural gardener. Welcome to Garden Wise Gadgets Home of the original WiseHanger, Lasso-n-Hang, the expandable plant hanger. It is better than other plant hangers such as macrame plant hangers, plastic plant hangers or iron plant hangers as it is expandable and will not rust or deteriorate. It’s both a great outdoor plant hanger and indoor plant hanger as it blends with any décor. 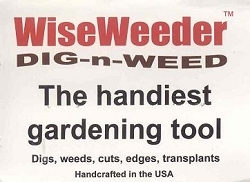 Also the WiseWeeder, the handiest multipurpose gardening tool. It is a digger, weeder, edger, trimmer, patio knife. Our gardening gadgets are the perfect gifts for the natural gardener or plant lover.